More than a decade ago, I was introduced to still hunting for deer by a co-worker, Gene, before I married and moved away from my hometown. Being a new deer hunter at the time, I was beyond the edge of my ability with the more experienced sportsmen in my usual group of hunting buddies and had grown increasingly frustrated with my early experiences and my inability to keep up with the running deer we pushed in our drives. For me, it bothered me to the point I considered not deer hunting at all. With that sentiment issued in a discussion with Gene, I was incredibly lucky to find a mentor willing to explain the alternative process of identifying travel corridors, watching for movement, and generally just enjoying the experience of being outdoors in November as the world shifts from one season to the next. From that one hunt – which ended with a good shot on a great deer – I started on a different path, through silent stands and hillside vantage points that allowed me to absorb not only the nature of bucks and does, but also the world that came to life around me; finding patience where there was none and ultimately success, regardless of whether I drew my bow or fired a shot. Longing to relive that experience, I had coordinated a return trip with Gene to the oak bottoms where my deer hunting experiences truly began. As of the lottery deadline in June, there would be as many as four in our group, but with the hit-and-miss nature of the process, I was the only one to draw a tag; a fact that was revealed to me only as Gene picked me up from the old family home, when I asked what he’d be shooting. “It’s just you this year,” he said, as my sense of incredible indebtedness to the man deepened along with my respect for his kindness and devotion to my success in the outdoors, many years after he had first spurred it in the direction that ended up being right for me. We caught up along the forty-minute drive south of town, passing familiar turns in the road and bends in the river that wound through the valley with the two-lane blacktop. Talking fishing, hunting and the changes in our lives over the last decade – he now enjoying the flexibility of retirement, and I in the throes of parenthood – we made our way to the spot where it all began. Instead of hunting from the hilltop vantage point that I remembered, we dipped down into the valley to shield ourselves from the roaring winds that bent every reed and blade of grass along the gravel trail leading to the river. A half hour ahead of the season’s start, we settled in at the bottom of the hill that dropped fast through the leafless oak trees. Gene pointed out the trails and ridges where he expected the deer to move as the last of the morning wore on and I raised my gaze to study the up-and-down cuts against the hillside. Tucked against the bases of the last few oaks that led to a pasture below, we updated each other on the time, when we dared remove our hands from our gloves to check. As the final moments ticked away and the season officially opened, I loaded the magazine of my .30-06 with three cartridges. “Not going with just one,” Gene asked with a laugh, before I informed him my hot streak of shooting and good luck in the field did not apply to deer in my recent adventures. Overhead, Canada geese rode the fast-moving wind south with an almost desperate quickness that changed the pitch of their honks as they sailed by. The occasional large, puffy cloud would drop the slightest sparkle of snow and the small mixed herd of Hereford and Angus cattle behind us munched their way through the still green grasses hidden underneath the brown and white covering of mixed oak leaves and snow. Through my four layers, I could feel the wind on my shoulders as I repeatedly shifted my view from left to right across the top of the steep hill 125 yards above me, hoping for movement despite the challenging conditions. As we waited for signs of action in the already-gnawing cold, the small group of cows wandered near to where we sat. The blonde, curly-haired Herefords paid us little attention as they strolled by, occasionally raising their blueish cue-ball sized eyes to figure out our purpose, before a quick dismissal and a return to lunch. The young Black Angus bulls, however, were a little warier and the last one in the group who had been oblivious to our presence stopped surprised a few feet short of my seat and stared me down with great hesitation when he realized I wasn’t a stump. After a brief standoff, he went back to his feeding and headed away with the rest of the herd, the crunching and snapping of grass fading quickly into the wind. “Right there,” Gene whispered as he caught motion at the top of the hill to our right, “it’s a buck,” he continued. I had flashbacks to my first hunt with him as I squinted to pick up the gray-coated animal in the brush and tree trunks at the top of the rise. Finally, as it ducked into some cover, I caught the flicker of its tail and hindquarters and tried to track it in my scope. A few minutes later, Gene would point out three more deer coming from the opposite direction: a doe and two yearlings. The motion was immediately encouraging, and my body quickly warmed with the release of endorphins. Shortly thereafter, a buck ghosted into view and came down the first trail, head lowered on the scent of the trio that had just moved through. I raised my gun to find him with my crosshairs, and by the time I had acquired his silhouette, he had jerked his head upright, staring down at the motion I had made. With his alarmed, erect stance, his dark-tined rack was highlighted by the white hillside and glinting sunlight filtering down through the blue openings between the clouds. I centered low on his chest for the uphill shot as Gene had advised on our trip into the bottom, breathed deep and squeezed the trigger. The buck collapsed in my scope and fell where he had stood. There would be no second shot, no run into the woods and no tiring tracking effort, only an uphill climb to a respectable five-by-five that lay still on the brown-and-white carpet of the riparian woods. “Great shot,” Gene congratulated as he echoed my thoughts of an easy retrieve while we both shuddered with the release of adrenaline mixed with the growing chill of the afternoon, “an hour and ten minutes, that’s a short season,” he continued with a laugh, though I am certain we were both happy we would soon be able to warm up out of the elements with a punched tag and another amazing moment in the books. After a downhill drag to the gravel road, Gene went to get the truck. 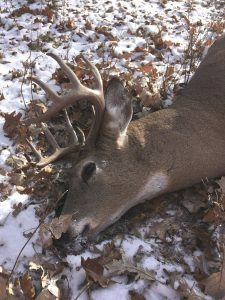 As I had with my first buck taken in the area more than 10 years ago, I placed my hand on the still-warm neck of the animal and whispered the hunter’s prayer which restored my confidence from things remembered and grew my admiration for Gene and the people like him who have changed my life for the better and continued to do so…in our outdoors.